Zürich, Braginsky Collection, B112: Bezalel Ranschburg, Pithei Niddah ("Porta dell’impurità") (http://www.e-codices.unifr.ch/it/list/one/bc/b-0112). Versione PDF del catalogo "A Journey through Jewish Worlds"
Although Rabbi Bezalel Ranschburg (1762–1820) never served officially in a rabbinic position, he was still highly regarded as one of the leading rabbinic scholars of his age in Prague and beyond. Prague, a center of Jewish learning, was also the home of the famous Rabbi Ezekiel Landau, an older contemporary and friend of Ranschburg. 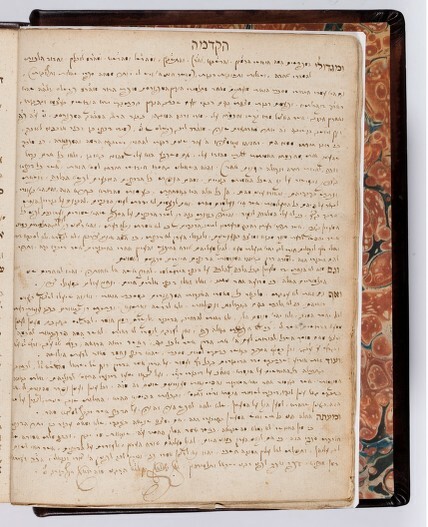 The rabbinic learning of Ranschburg is manifest in his commentaries on two difficult Talmud tractates, Horayot and Niddah, the manuscript displayed here. In his introductions to these works, Ranschburg wrote that he chose them because of their difficulty and because they were not among the regular staples of the yeshivas. His glosses were printed on the pages of the standard Talmud editions; he was also the author of responsa and other commentaries, now lost. In addition, Ranschburg possessed a remarkable library of Hebrew books. In order to be printed in the Kingdom of Austria in the eighteenth and early nineteenth centuries, Hebrew books required the permission of the royal censor. The censor in Prague in Ranschburg’s time was Carolus Fischer (1755–1844), whose name appears on many books printed there. Fischer, of Christian birth, was extremely well-versed in Hebrew language and literature. He was an enlightened person who defended Talmudic and rabbinic writings against their Christian detractors. An extensive Hebrew correspondence, consisting of about fifty letters between him and Ranschburg, is extant. In the censorial approval of Ranschburg’s commentary to Horayot, Horah Gever (Prague, 1802), Fischer described Ranschburg as a rabbi well known to him and famous for his learning. Fischer’s signed approval in Latin (1815) appears in the present manuscript. For reasons unknown, however, this work was not printed at that time. It was first published from this manuscript in 1957. From: A Journey through Jewish Worlds. Highlights from the Braginsky collection of Hebrew manuscripts and printed books, hrsg. E. M. Cohen, S. L. Mintz, E. G. L. Schrijver, Amsterdam, 2009, p. 144. A Journey through Jewish Worlds. Highlights from the Braginsky collection of Hebrew manuscripts and printed books, hrsg. E. M. Cohen, S. L. Mintz, E. G. L. Schrijver, Amsterdam, 2009, p. 144-145.